Copenhagen is known for it’s future forward architecture, thoughtful design and as one of the most people friendly cities in the world. 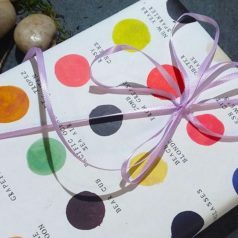 I attribute the city’s propensity for Good Design to Danish culture which values and fosters creativity. The sense of curiosity, intelligence and playfulness was evident across my research and I believe their cultural approach to design is a key factor to the city’s success. 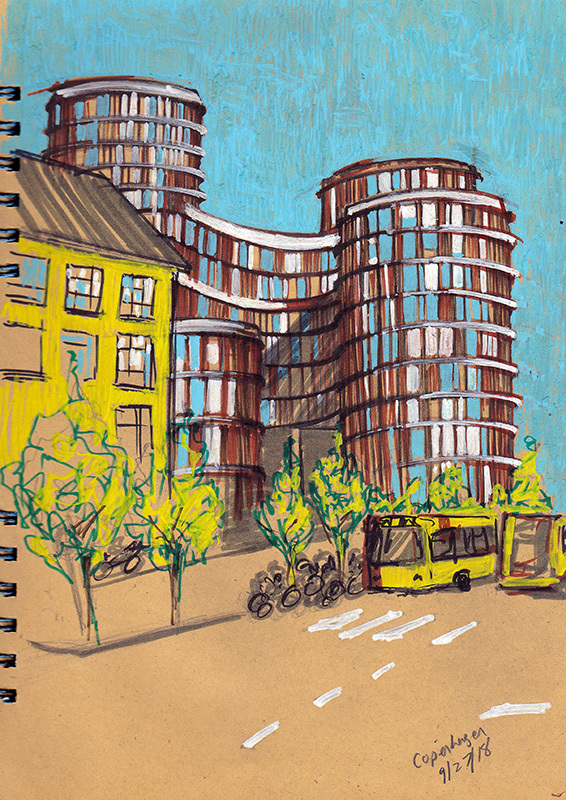 While researching design and city planning, I spent a great deal of time sketching to observe and express what I saw. 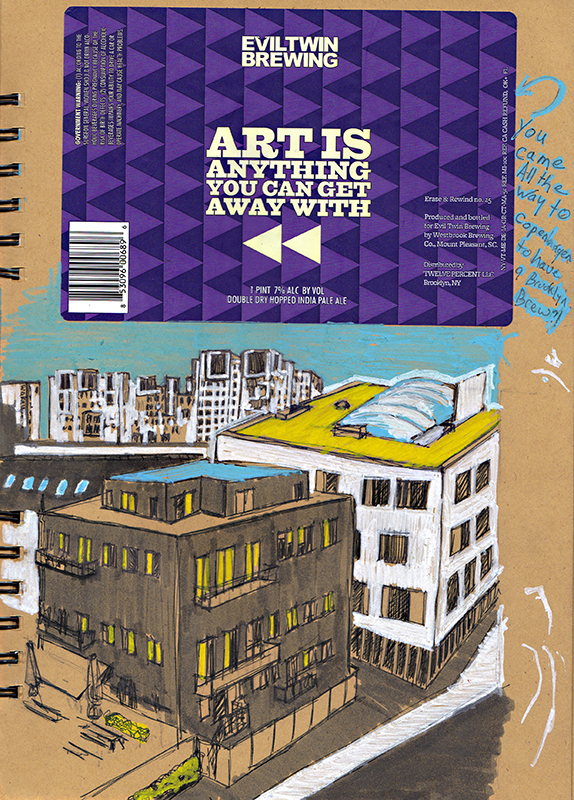 Check out my sketch Journal from grant research in Copenhagen, Denmark. 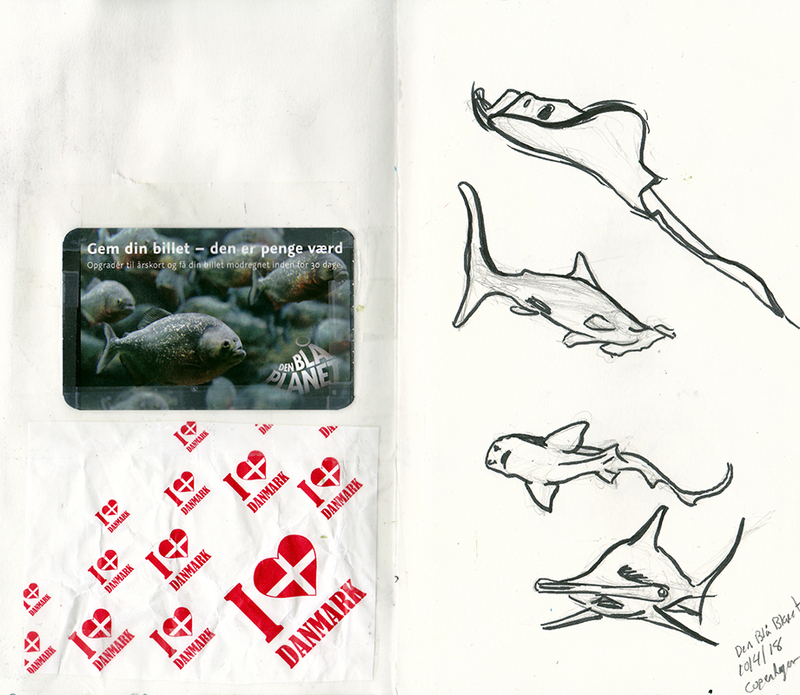 These sketches were made possible by the IFDA EF Valerie Moran Grant. 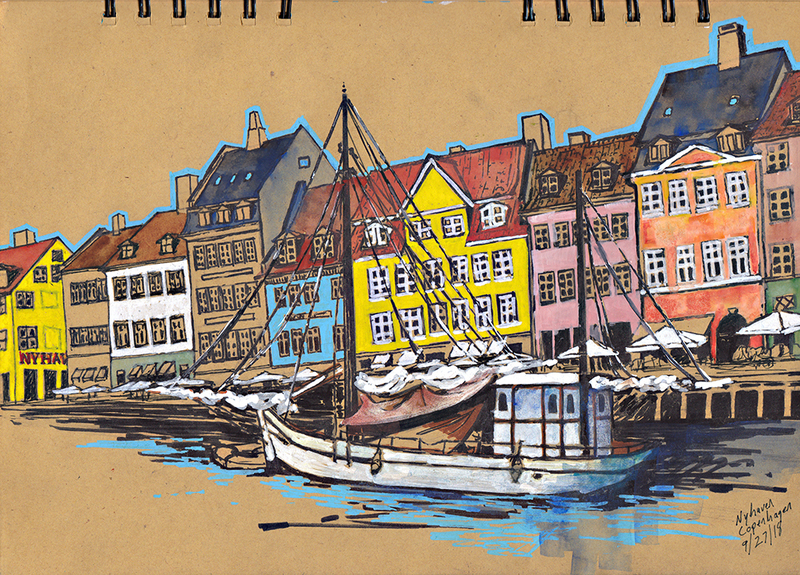 Starting with the historic 17th century canal and entertainment district, I wanted to sketch the iconic multi-colored buildings and wooden ships that line the harbor. The jagged roof lines and colorful blocks reminded me of Egon Schiele village paintings and I wanted to do some watercolor studies similarly. 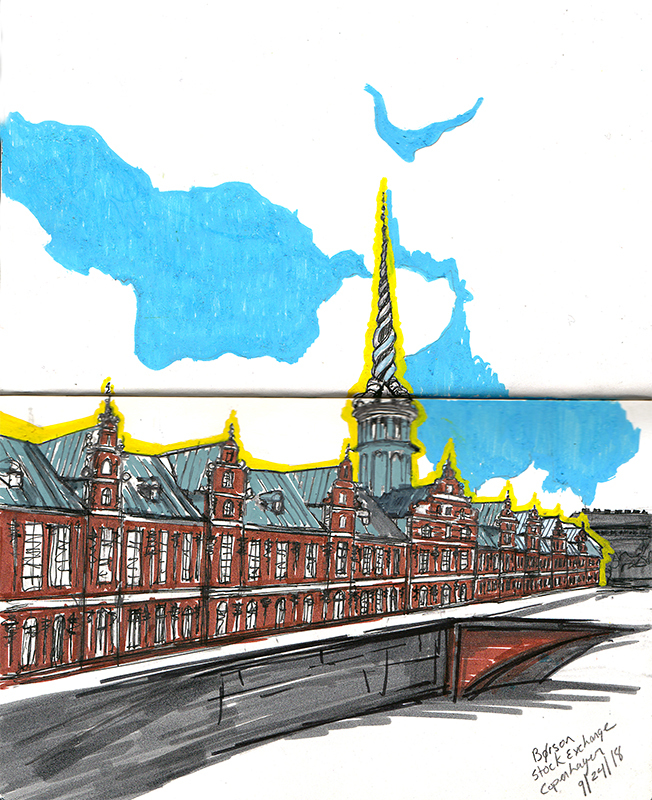 However, Copenhagen inspired in me a totally new style of sketching. 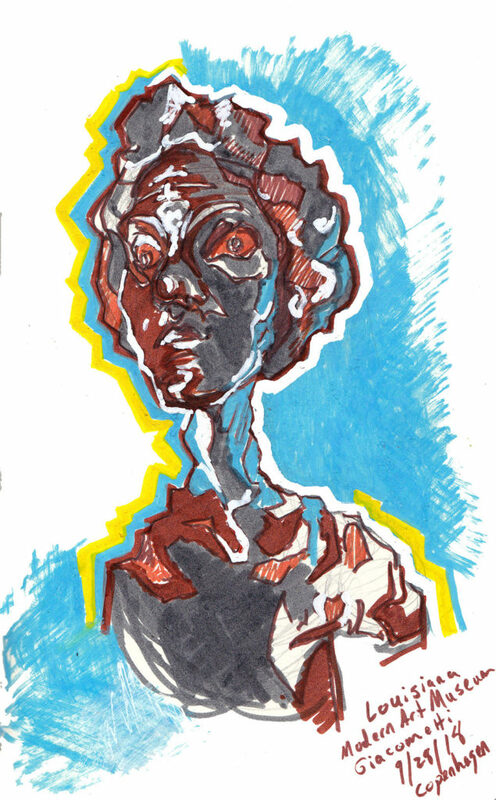 When I left New York, I picked up some paint markers not really knowing what I wanted to do with them but they looked fun. 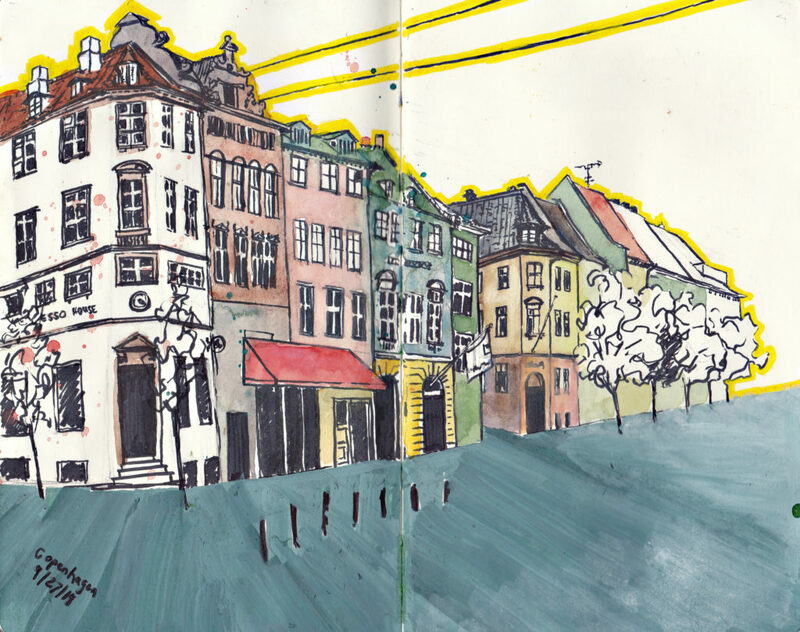 Everything about Copenhagen inspired the use of these markers, I rarely pulled out the watercolors. 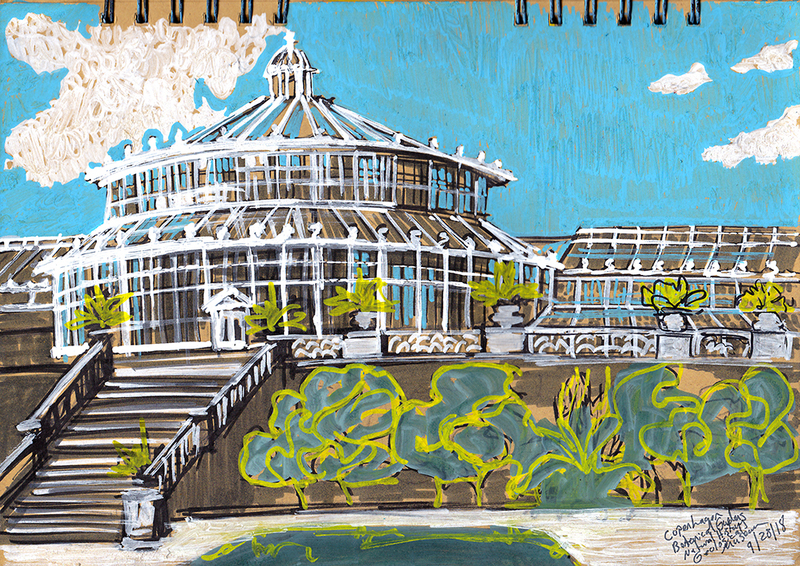 You can see the difference in styles if you check out my sketch journal from Paris here. 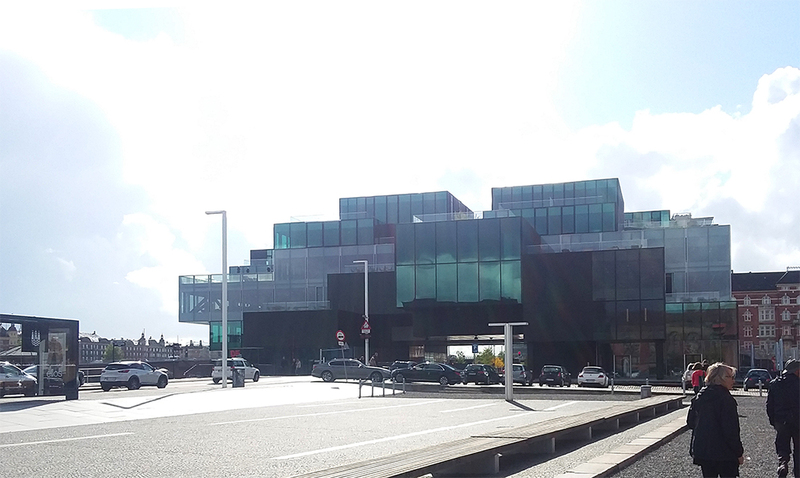 My research started at the Dansk Arkitekture Center (DAC) located in the new BLOX building, designed by Rem Koolhaas of the Office for Metropolitan Architecture (OMA). The BLOX Building is a multi use structure containing exhibition space, offices, a bookstore, a fitness center, a restaurant, and twenty-two apartments as well as an underground automated car park. The configuration of transparent blocks is intended as an “urban activator,” exposing disparate activities and fostering infinite and unpredictable encounters. The BLOXHUB, also located in the BLOX building is a co-creator space founded on the belief that collaboration across sectors in technology, architecture, design, construction and research are necessary to solving the challenges facing the future of urban development and climate change. The Danish culture of education, collaboration and curiosity is what brought me to research here. The BLOX concept was an excellent place to start. Wandering through the museum space was a bit confusing but fostered discovery of the other spaces. With transparent walls, I could see the gym and office spaces of people holding meetings. I felt imposing to watch them and then curious to join them. 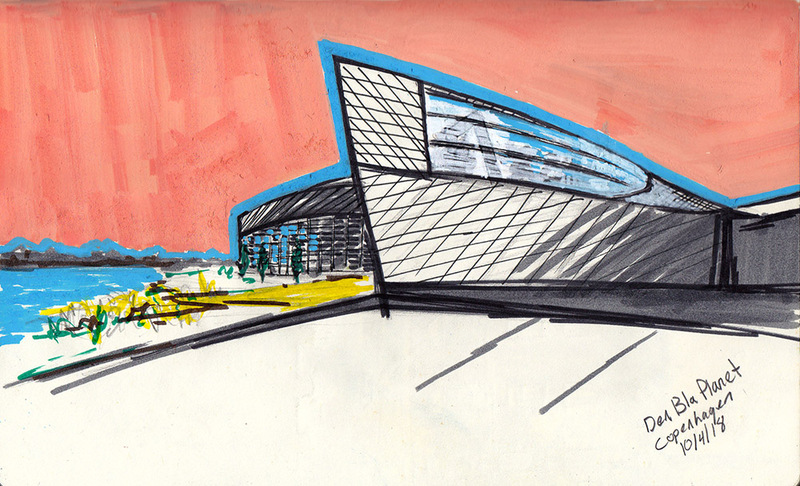 There definitely is the sense of “infinite unpredictable intrigue” the architect intended. However, it was a little distracting and disruptive of focus on the exhibits. 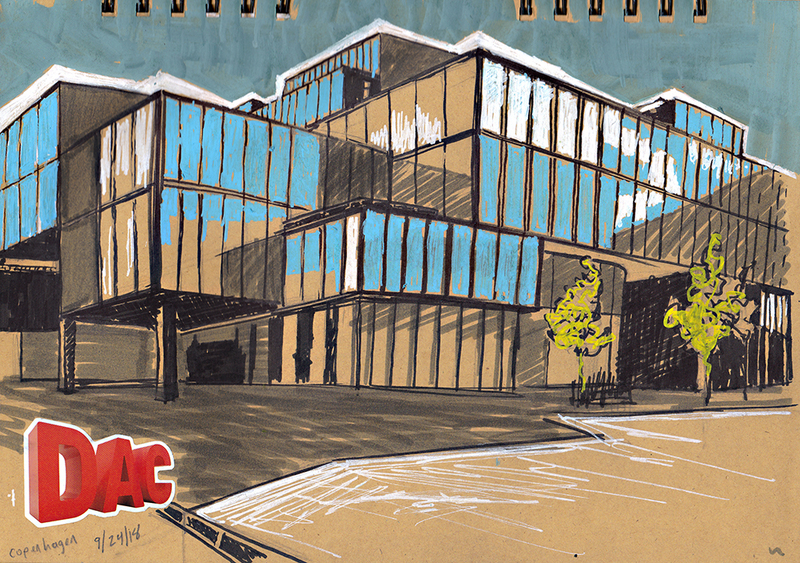 The DAC Workspace was most exciting to me, with the flourishes of creative exploration and playful iteration. It felt like a truly creative space that welcomed expression and experimentation which is something design companies in the states talk about but compromise for the sake of quick to market development and cost effective ROI. I felt a sense of excitement that my expectation of Danish culture toward design may be accurate. 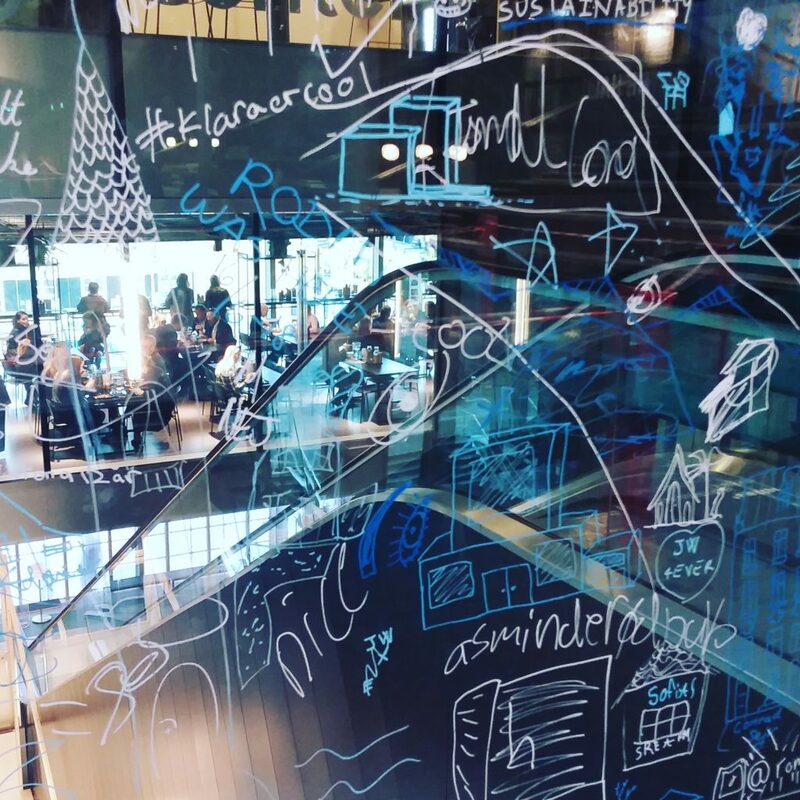 There were drawings on the glass windowed walls, papers hanging from the ceiling and scattered on table tops. There were also dimensional models made of unconventional materials by children. It was interesting to see young imaginations learning how to think in this way. I remembered the paper model I built when I was a kid and how that model got me into the “Gifted and Talented” program in school. I wondered what would have happened if I had never taken it upon myself to build a tropical island out of an Etch-A-Sketch box. 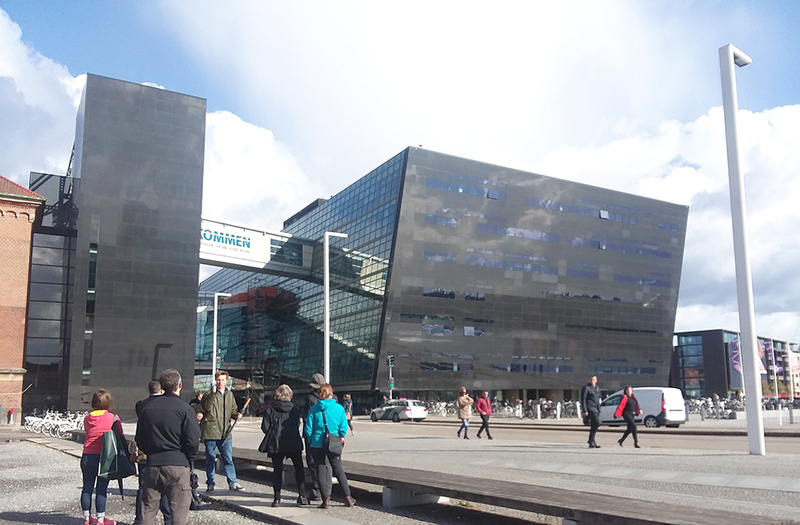 Near by the BLOX is a stylistically similar attraction, the Royal Library nicknamed the Black Diamond for its polished granite cladding and irregular angles. The extension to the library was designed by Danish architect Schmidt Hammer Lassen and completed in 1999. 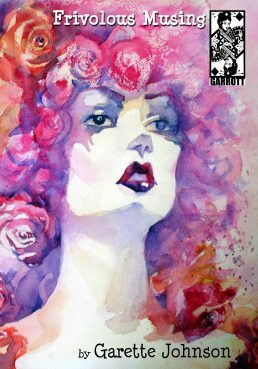 In my sketch, I wanted to express the dynamic, apparent motion of the angles and implicit curve that resulted from it appearing to lean forward. 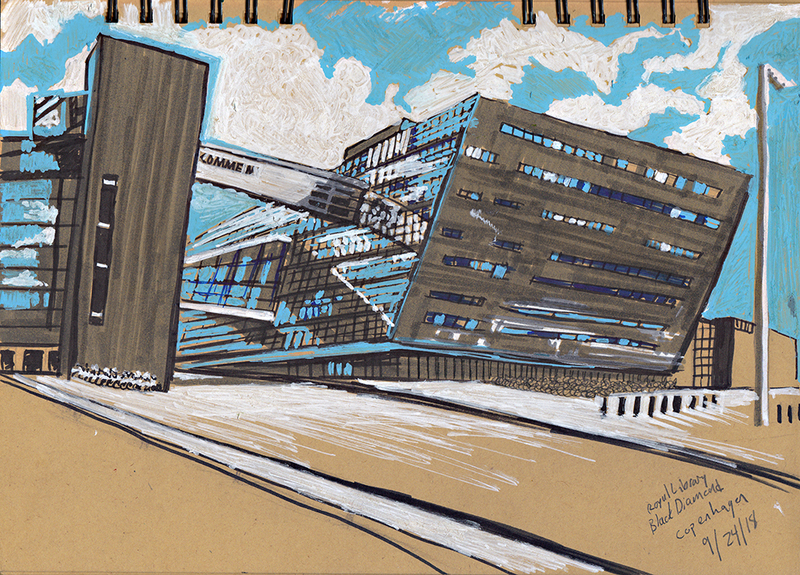 The building’s position reminded me of the Futurist Dynamism sculpture by Umberto Boccioni “Unique Forms of Continuity in Space.” The sense of colossal mass dwarfing pedestrians and bicycles felt monumental, I needed to sketch the feeling of THAT. Børsen, the oldest stock exchange in Denmark and one of the oldest buildings in Copenhagen is known for its tail twisted dragon spire and variety of sculpted busts that line the long exterior walls. It was constructed in the early 17th century at the request of King Christian IV as part of his plan to strengthen Copenhagen’s role as a center for trade and commerce in Northern Europe. Architect Lorenz van Steenwinckel was charged with the assignment but died and his brother Hans van Steenwinckel took over. I love how mythological motifs of the old sit together with the modern dynamism of the new in Copenhagen and seem to communicate the inherent sense of vitality and strength of culture through design. Architect and city planner Jan Gehl, played a key role in the process that made Copenhagen one of the most human-centric cities by prioritizing pedestrian and bike areas. The city established Strøget as a pedestrian street in 1962 with mixed skepticism. It’s change was the beginning of Copenhagen’s urban design strategy to divert vehicle traffic away from the city center and reduce congestion. The strategy was controversial at the time and quickly revealed itself to benefit the bustling retail and cafes along Europe’s longest pedestrian shopping street. The strategy expanded slowly, as more squares were emptied of cars. Copenhagen has since become internationally influential to urban planning and design. In fact, lack of parks, pedestrian and bike paths is considered a contributing cause of obesity in American cities. 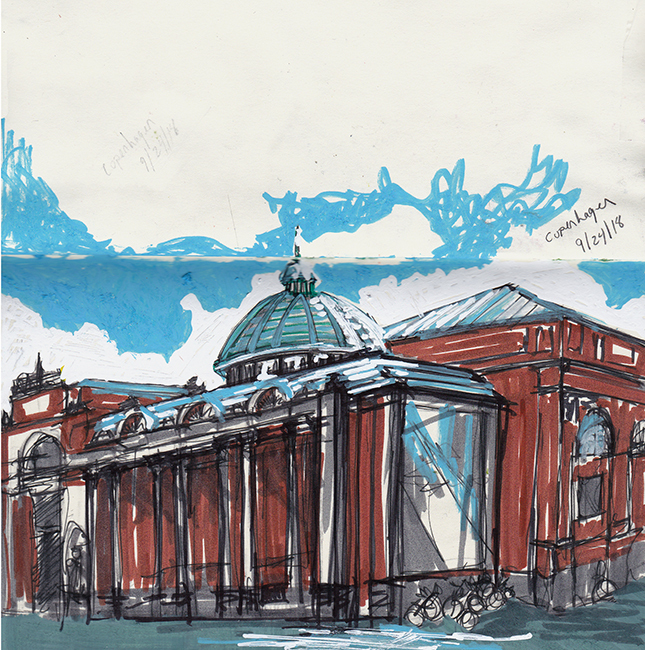 I sketched this view right near the wicked cool design store Hay, which I’ll talk about in another post. 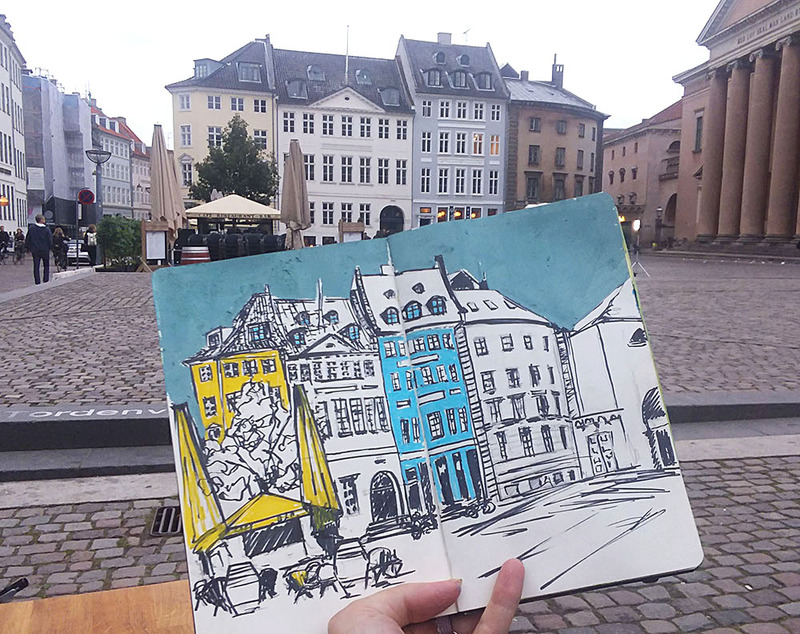 Gammeltorv Square is one of the oldest market places in Copenhagen dating back to the 12th century. It is also the former location for many city halls and most of the buildings existing today were built after the Great Fire of 1795 in the Neoclassical style. This building isn’t the focal points of the square at all. However, I was attracted to the roof lines and rounded ends as much as the fact that I could get a beer from a kiosk which was given poured into a glass. Classy Danes. Speaking of beer supporting the arts… The Ny Carlsberg Glyptotec is a museum dedicated to the sculpture and painting collections of Carl Jacobsen, son of the founder of Carlsberg Breweries. Originally, Jacobsen collected the works in his private villa, adding extensions as the collection grew. Eventually, he donated portions of the collection to the city requiring that the collection have it’s own home. Jacobsen appointed architect Wilhelm Dahlerup to design the new museum which opened in 1897. Subsequent additions were made as additional portions of the collection were donated. The building underwent expansion around 1906 and again in 1996 and complete renovation in 2006. The brew master’s son certainly appreciated the finer things, what a gift for the city of Copenhagen. There are so many innovative residential concepts in Copenhagen, including 8 Tallet, VM Houses, and Tietgen Student Residence. I wanted to get the real life experience of living in a neighborhood of Copenhagen so I rented an AirBnB in Vesterboro. It was a cute flat at the top of a five floor walk up with loft views of a courtyard and distant, wicked cool buildings. So, I sketched the view looking out the dinning area window. Yes, another beer label here, and I was very sorry to mistakenly purchase a Brooklyn brew as my first toast to the town. Sorry about that. These interesting bronze towers were located on a stretch I called the Vegas strip because of how it was lit up at night. Axel Towers was designed by Danish firm, Lundgaard & Tranburg Architects. The clustered orientation of the towers create a concentric pathway drawing and welcoming the public into the ground floors containing shops, restaurants and a raised garden while upper floors house private office spaces. Another aspect I love about urban design in Copenhagen is the areas of public access and open green spaces that are inclusive. In the case of Axel Towers, the path of going is designed. 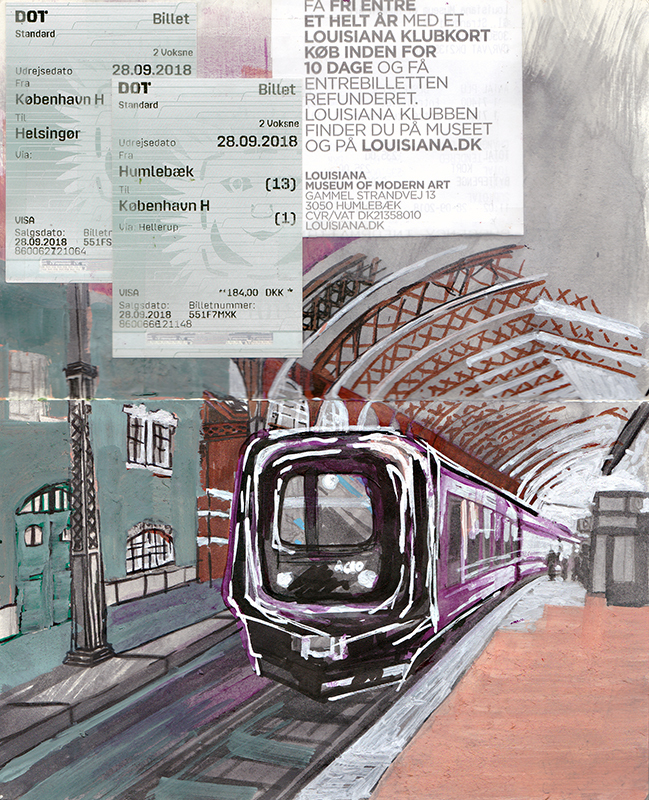 Conveniently, my neighborhood stay in Vesterbro was right near central station making it easy to catch an early train to Humlebæk. The must see, Louisiana Museum of Modern Art was highly recommended. Check out my post on the Moon exhibit for a closer look at what I found there. 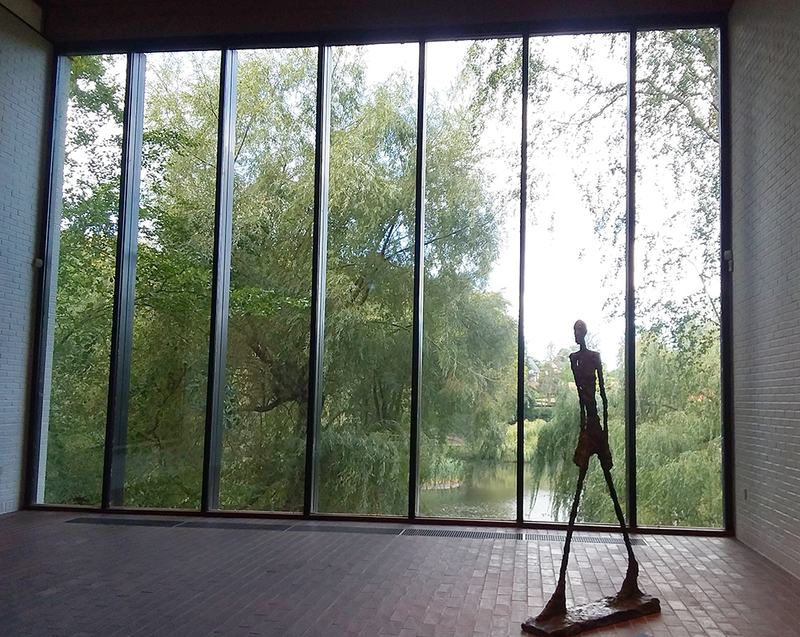 I’m a big fan of Giacometti and was delighted to see so many sculptures against the natural landscape of the museum’s indoor/outdoor design. The Danes are excellent at crafting interactive green space. The Copenhagen Botanical Gardens is part of the museum district located in Kings Garden called Parkmuseerne. I would describe it as a large campus-like Central Park which includes the University of Copenhagen Faculty of Science, the Geological Museum etc. All six museums can be experienced with the purchase of one ticket. I am impressed that these museums can be experienced in this way, making science and artifact accessible with an emphasis on education through discovery as opposed to an amusement park-like setting or a single museum experience. 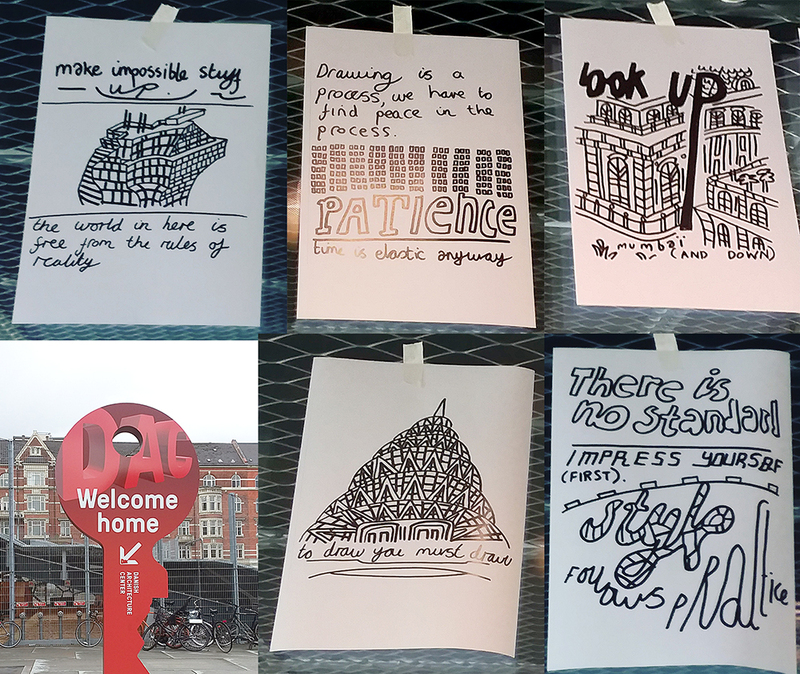 The holistic approach to learning through experience is another example of Copenhagen’s cultural value of education and curiosity. After walking around the garden and seeing as many museums as I could before they closed, I got a bit hungry and lacking in zip. Realizing the trip was almost over and I had not yet experienced the legendary pastries, it seemed like a perfect opportunity to fill up on sugar and coffee. Luckily, Nørreport Station was near by with the unfussy bakery,Taffelbay. 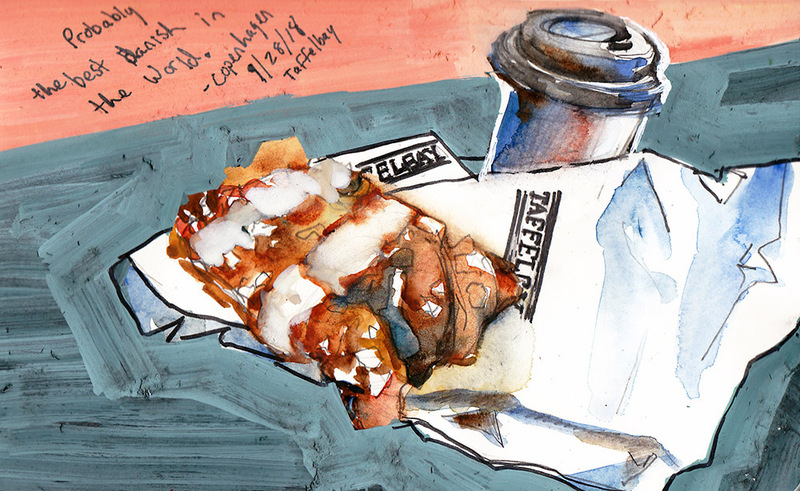 It was the only batch of baked goods I had the whole trip, so I am not sure how Taffelbay stacks up to competition. However, in my opinion, and as the Carlsberg Brewery would say, it was ‘probably the best danish in the world’. Europe’s largest and most state-of-the-art aquarium was shaped after a whirlpool by Danish architect company 3XN. Another reason I love Danish architecture is because environment and energy are part of the design. To reduce energy consumption, the building is equipped with cooling units using seawater from Øresund and double panes of glass separated by a gas vacuum that reduce heat transfers in parts of the building. The structure of the building seems to ebb and flow quietly in the landscape just meters from Øresund. The aquarium also serves to educate and improve our understanding of the ocean and to help preserve this precious component to our ecosystem by collaborating with Danish and international scientists. The aquarium is also committed ridding the oceans of plastic pollution. 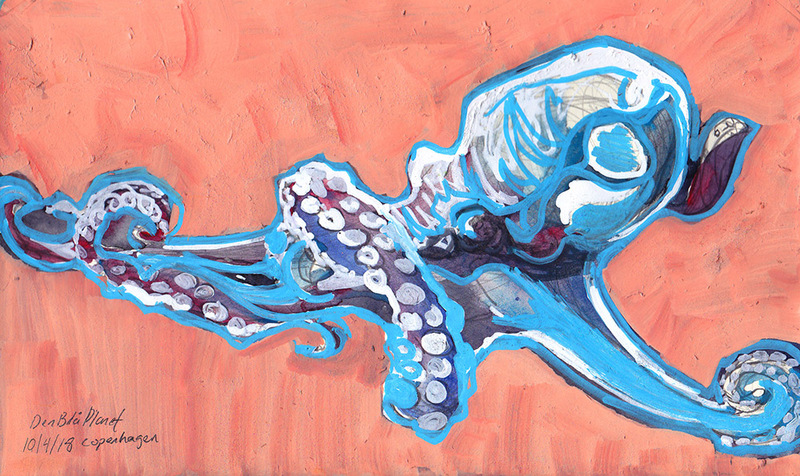 I love sketching animals and was delighted to find they have an octopus. I visited the tank frequently to see if he/she would get playful and on my last pass was able to get video to sketch from. Like the Atlanta Aquarium, there is a large room to fully immerse yourself in the underwater world. 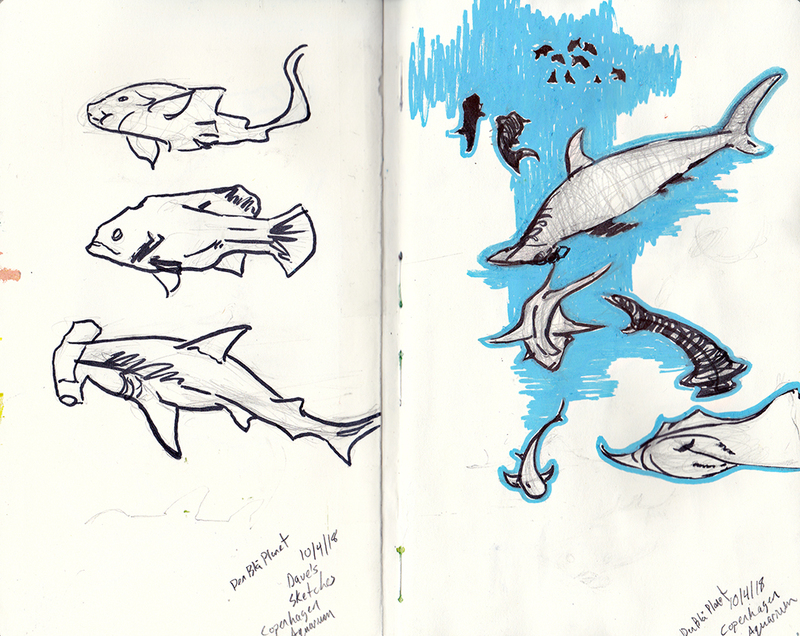 Sitting for a few hours, Dave and I were able to capture a few simple gestures of sharks and rays. I found the cultural values of creativity, sustainability, inclusiveness, and curiosity motivated design that was innovative and practical. 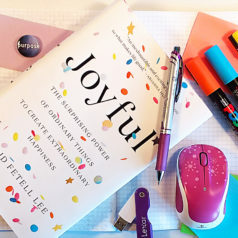 Its worth taking a look at how we approach design and what problems we are trying to solve to determine if we could be doing better. Stay tuned for my next post on building strategy into the design process using long term thinking Scenario Planning. 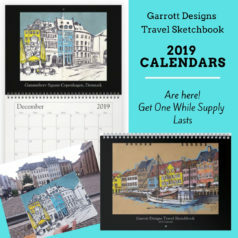 Be sure to check out my previous post from the Louisianna Museum of Modern Art and If you’d like to hear more about my research in Copenhagen, scenario planning, and design be sure to subscribe to my Newsletter in the below banner. Don’t miss a thing!